Sodium hypochlorite is an oxidizing agent. When dissolved in water, it is commonly known as bleach. It is a colorless or pale yellow watery liquid. People easily recognize its smell, which is like chlorine. In health applications, sodium hypochlorite acts as an antiseptic. Doctors use it in surgical procedures to dissolve dying tissue and to cleanse dirty wounds. Water companies use bleach to disinfect water making it safe for consumption. It acts as a disinfectant in laundry and dishwasher applications. Apparel and footwear care products contain bleach for the same reason. Food processors use bleach to sanitize surfaces and equipment and to kill bacteria. Industrial users add bleach to water systems to act as a biocide and reduce grime. Household bleach is formulated with very small amounts of sodium hypochlorite (usually from 3 to 8 percent) and used to clean, disinfect and bleach. It is considered a household hazardous waste. What are the Dangers of Sodium Hypochlorite? On its own, sodium hypochlorite causes burns to the skin and eyes on contact. Never ingest a product containing bleach. Extreme cases of exposure could even result in death. The primary hazards of sodium hypochlorite come from its reactivity with other chemicals. It releases chlorine gas when mixed with acids. Chlorine is highly toxic causing severe burns to skin, lungs and eyes. As an oxidizer, hypochlorite generates heat when reacting with reducing agents, leading to the potential of fire or explosion. Exposure to organic matter, oil, hydrocarbons or alcohols causes explosive reactions. If hypochlorite is present in a fire, it may act as an accelerant creating dangerous conditions for fire fighters. Because bleach vents oxygen slowly in storage, it builds up pressure in containers. These could burst leading to a spill and injuries. It emits toxic fumes when heated. Sodium hypochlorite is extremely toxic to aquatic life. Always take precautions to ensure no spill reaches natural waterways. 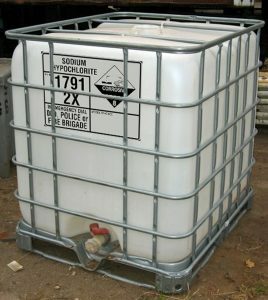 Sodium hypochlorite should be stored separately from incompatible materials. Store chemicals such as reducing agents, organic materials and acids away from bleach. Sodium hypochlorite storage needs to be at temperatures below 68 F (20 C) in air-tight bottles. Variations from these conditions may cause it to vent oxygen, resulting in pressure buildup and the possibility of spills from burst containers. U.S. Chemical Storage provides climate controlled chemical storage buildings for safe bleach storage within its recommended temperature range. All buildings feature built-in containment sumps to capture leaks and spills. Mechanical ventilation provides a steady airflow through the building if required. U.S. Chemical Storage buildings are compliant with all regulatory standards. Climate control accessories are available to meet the specific bleach storage requirements. Contact U.S. Chemical Storage now to inquire about our solutions for sodium hypochlorite storage.